"Delicious! This favorite recipe has been passed down in the family for many years. 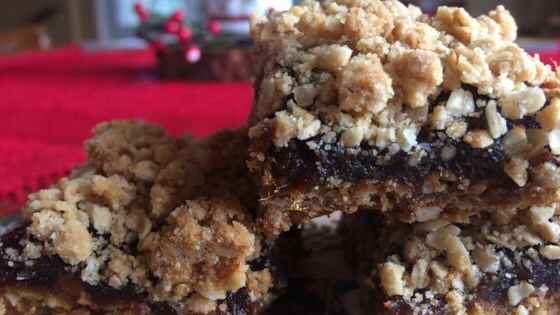 It has lots of date filling and can be stored in the refrigerator for a week." Heat dates, 2/3 cup brown sugar, orange juice, and orange zest in a saucepan over low heat; cook, stirring occasionally, until dates have softened, absorbed the liquid, and mixture is like a paste, about 10 minutes. Remove from heat; stir in vanilla extract. Stir oats, flour, 1 cup brown sugar, baking soda, and salt together in a bowl; cut in butter with a knife or pastry blender until mixture resembles coarse crumbs. Lightly press 2/3 of the crumb mixture into the bottom of a 9x9-inch pan. Spread date mixture evenly over the crumb crust; sprinkle remaining crumbs evenly over the top of date mixture. Bake in the preheated oven until top is golden, about 30 minutes; cool on a wire rack for at least 1 hour before slicing into bars. Water can be substituted for orange juice. delicious. Anyone know why they are called matrimonial squares? Very tasty! Tastes like those much mom used to make, Even my wife liked them, and she doesn’t really care for dates!